Guided media, which are those that provide a conduit from one device to another, include Twisted-Pair Cable, Coaxial Cable, and Fibre-Optic Cable. A signal travelling along any of these media is directed and contained by the physical limits of the medium. Twisted-pair and coaxial cable use metallic (copper) conductors that accept and transport signals in the form of electric current. Optical fibre is a cable that accepts and transports signals in the form of light. A twisted pair consists of two conductors(normally copper), each with its own plastic insulation, twisted together. One of these wires is used to carry signals to the receiver, and the other is used only as ground reference. The receiver uses the difference between the two. In addition to the signal sent by the sender on one of the wires, interference(noise) and crosstalk may affect both wires and create unwanted signals. If the two wires are parallel, the effect of these unwanted signals is not the same in both wires because they are at different locations relative to the noise or crosstalk sources. This results in a difference at the receiver. It is the most common type of telecommunication when compared with Shielded Twisted Pair Cable which consists of two conductors usually copper, each with its own colour plastic insulator. Identification is the reason behind coloured plastic insulation. Higher grades of UTP are used in LAN technologies like Ethernet. It consists of two insulating copper wires (1mm thick). The wires are twisted together in a helical form to reduce electrical interference from similar pair. Provides less protection from interference. This cable has a metal foil or braided-mesh covering which encases each pair of insulated conductors. Electromagnetic noise penetration is prevented by metal casing. Shielding also eliminates crosstalk (explained in KEY TERMS Chapter). It has same attenuation as unshielded twisted pair. It is faster the unshielded and coaxial cable. It is more expensive than coaxial and unshielded twisted pair. One way to measure the performance of twisted-pair cable is to compare attenuation versus frequency and distance. As shown in the below figure, a twisted-pair cable can pass a wide range of frequencies. 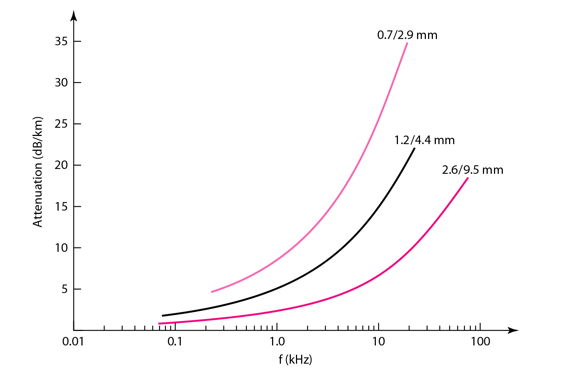 However, with increasing frequency, the attenuation, measured in decibels per kilometre (dB/km), sharply increases with frequencies above 100kHz. 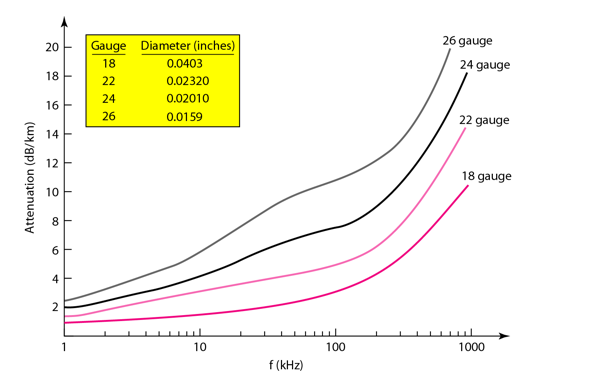 Note that gauge is a measure of the thickness of the wire. In telephone lines to provide voice and data channels. The DSL lines that are used by the telephone companies to provide high-data-rate connections also use the high-bandwidth capability of unshielded twisted-pair cables. Local Area Network, such as 10Base-T and 100Base-T, also use twisted-pair cables. Coaxial is called by this name because it contains two conductors that are parallel to each other. Copper is used in this as centre conductor which can be a solid wire or a standard one. It is surrounded by PVC installation, a sheath which is encased in an outer conductor of metal foil, barid or both. Outer metallic wrapping is used as a shield against noise and as the second conductor which completes the circuit. The outer conductor is also encased in an insulating sheath. The outermost part is the plastic cover which protects the whole cable. To connect coaxial cable to devices, we need coaxial connectors. The most common type of connector used today is the Bayonet Neill-Concelman (BNC) connector. The below figure shows 3 popular types of these connectors: the BNC Connector, the BNC T connector and the BNC terminator. This is a 50 ohm (Ω) coaxial cable which is used for digital transmission. It is mostly used for LAN's. Baseband transmits a single signal at a time with very high speed. The major drawback is that it needs amplification after every 1000 feet. Single cable failure can fail the entire network. Difficult to install and expensive when compared with twisted pair. If the shield is imperfect, it can lead to grounded loop. We can measure the performance of a coaxial cable in same way as that of Twisted Pair Cables. From the below figure, it can be seen that the attenuation is much higher in coaxial cable than in twisted-pair cable. In other words, although coaxial cable has a much higher bandwidth, the signal weakens rapidly and requires the frequent use of repeaters. In traditional Ethernet LANs. Because of it high bandwidth, and consequence high data rate, coaxial cable was chosen for digital transmission in early Ethernet LANs. The 10Base-2, or Thin Ethernet, uses RG-58 coaxial cable with BNC connectors to transmit data at 10Mbps with a range of 185 m.
A fibre-optic cable is made of glass or plastic and transmits signals in the form of light. For better understanding we first need to explore several aspects of the nature of light. Light travels in a straight line as long as it is mobbing through a single uniform substance. If ray of light travelling through one substance suddenly enters another substance (of a different density), the ray changes direction. If the angle of incidence I(the angle the ray makes with the line perpendicular to the interface between the two substances) is less than the critical angle, the ray refracts and moves closer to the surface. If the angle of incidence is greater than the critical angle, the ray reflects(makes a turn) and travels again in the denser substance. If the angle of incidence is equal to the critical angle, the ray refracts and moves parallel to the surface as shown. Note: The critical angle is a property of the substance, and its value differs from one substance to another. Optical fibres use reflection to guide light through a channel. A glass or plastic core is surrounded by a cladding of less dense glass or plastic. The difference in density of the two materials must be such that a beam of light moving through the core is reflected off the cladding instead of being refracted into it. 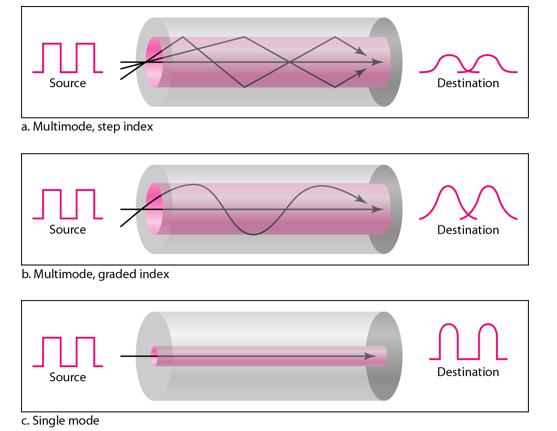 Current technology supports two modes(Multimode and Single mode) for propagating light along optical channels, each requiring fibre with different physical characteristics. 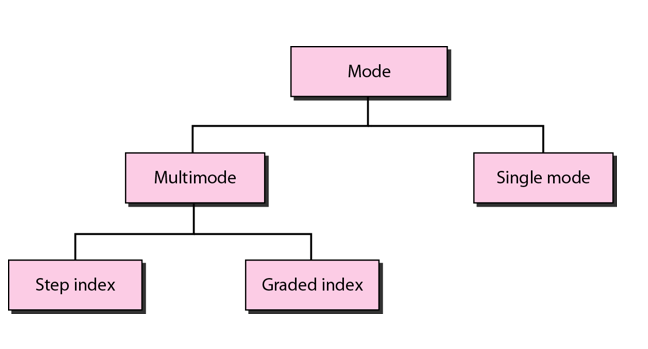 Multimode can be implemented in two forms: Step-index and Graded-index. Multimode is so named because multiple beams from a light source move through the core in different paths. How these beams move within the cable depends on the structure of the core as shown in the below figure. In multimode step-index fibre, the density of the core remains constant from the centre to the edges. A beam of light moves through this constant density in a straight line until it reaches the interface of the core and the cladding. The term step-index refers to the suddenness of this change, which contributes to the distortion of the signal as it passes through the fibre. In multimode graded-index fibre, this distortion gets decreases through the cable. The word index here refers to the index of refraction. This index of refraction is related to the density. A graded-index fibre, therefore, is one with varying densities. Density is highest at the centre of the core and decreases gradually to its lowest at the edge. Single mode uses step-index fibre and a highly focused source of light that limits beams to a small range of angles, all close to the horizontal. The single-mode fibre itself is manufactured with a much smaller diameter than that of multimode fibre, and with substantially lower density. The decrease in density results in a critical angle that is close enough to 90 degree to make the propagation of beams almost horizontal. The Subscriber Channel(SC) connector is used for cable TV. It uses push/pull locking system. The Straight-Tip(ST) connector is used for connecting cable to the networking devices. MT-RJ is a connector that is the same size as RJ45. Attenuation is flatter than in the case of twisted-pair cable and coaxial cable. The performance is such that we need fewer(actually one tenth as many) repeaters when we use the fibre-optic cable. Often found in backbone networks because its wide bandwidth is cost-effective. Some cable TV companies use a combination of optical fibre and coaxial cable thus creating a hybrid network. Local-area Networks such as 100Base-FX network and 1000Base-X also use fibre-optic cable.